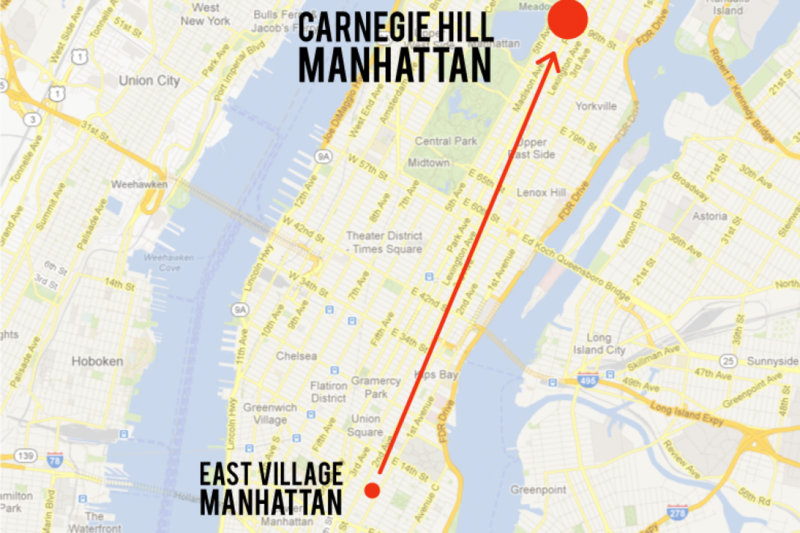 I lived in the East Village on East Fifth Street and Second Avenue until a month ago when I moved to Carnegie Hill. My old building was a sixth-floor walk-up, but luckily I was on the second floor. The total rent was $2,750. The bedrooms were decently sized by Manhattan standards -- I could fit my queen-sized bed and a dresser. But the kitchen, bathroom and living spaces were tiny. The “kitchen” was just an oven, a sink and a mini fridge. We had to buy a small island on wheels just to have space to dry our dishes. The bathroom didn’t have a full-size bath and shower. I loved the neighborhood, though, and rarely ever left. I never took cabs and would walk everywhere -- both in the East Village and to the Lower East Side. There were so many restaurants I loved that were within walking distance, like Sauce and The Meatball Shop -- both on the Lower East Side, and Beyond Sushi, an amazing vegan sushi place on 14th Street, where the food is so beautiful we always took pictures of it! We also loved Xi’an Famous Foods, a noodle shop on Saint Marks. Ultimately I decided to leave because I was moving in with my fiance and we found that the apartments we could afford all had really strange layouts or were really small. We decided to try the Upper East Side because we knew it was more affordable. All of our friends still live downtown and they make fun of us that we’re old -- even though we're only 25 -- since we moved to the Upper East Side. 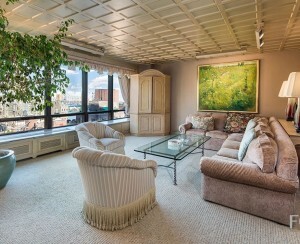 But we found a great apartment in a full-service elevator building in Carnegie Hill -- on 96th between Park and Lexington and the rent is $2,550 for a big one-bedroom with a large kitchen where we can actually cook. The neighborhood is very different than the East Village -- it’s a lot more quiet and family-oriented. The fact that it is different has both its perks and downsides. We love that is quiet and separated from all of the craziness of the city, but I miss being within walking distance of all of my favorite restaurants and bars. The East Village has a ton of college students because NYU is so close and there aren't many families in the area most likely due to the high rent and small apartments. Our new neighborhood is flooded with kids and families on the weekend which gives us a more homey feel. We also really like being close to Central Park. There are a few parks I visited in the East Village, particularly Tompkins Square park, but it is no comparison to Central Park. I run outside, and am very happy to have Central Park so close and explore new ground. There are also a lot more running paths on the Upper East Side than the East Village. The village is very foot- and car-heavy on traffic making it difficult (and dangerous) to run in the streets. One of the only running paths is to run on the water which is mostly flat, and can get boring after a few runs. The commute for me now is easy. I work at 7 World Trade and I take the 6 train to the 4 or 5. It takes about 30-35 minutes. It’s about the same commute because I had to walk far to get to the subway at my old place. We haven’t tried too many restaurants yet and are really enjoying being able to cook more, but we had the hamburgers at Ottomanelli’s the other day and they were really good. We also found a good Chinese place called 88 Wok on Third Avenue and 88th Street. The supermarket situation is fairly similar -- I used to walk to the Trader Joe's in Union Square and now I go to the Fairway on 86th Street and the distance is pretty much the same. There’s a wine store called Vinyl that we like that has a really cute dog. I also really like the New York Sports Club on Third Avenue and 91st Street. It’s much nicer than the one near my office. Our friends may call us old, but the Upper East Side feels more like home. We don't plan on moving for some years so we were able to spend both the time and money to make it feel more like home. 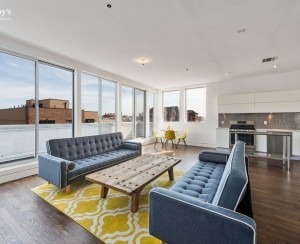 Also, the space is a definite factor contributing to the "homeyness" feel. For instance, on a lazy Sunday it was almost impossible to spend the entire day in my 450-square-foot two-bedroom apartment, yet it seems to be so easily done now.